When a band is described to soon be taking over their home country and around the globe with energetic death metal – you know it’s something that is going to be utterly ferocious and one to look out for. Deserted Fear are a trio from Germany, since forming in 2007 they have slammed out three filthy albums and a demo. The new album is no exception to this, consisting of 13 songs which are bursting with deep hatred, anger and power. For fans of Heaven Shall Burn, Decapitated and Obituary. The album title is nothing out of character for the genre, but it encodes some interesting hegemonic ideologies. ‘Drowned By Humanity’ connotes that humanity is power hungry, a vicious force that is gradually consuming and killing off people, animals and other aspects. Moreover, it represents that humanity is turning on its own kind, this could be referencing to a political context, being that the elite in society demonstrate social closure, protecting themselves and keeping others out. For me, the ‘Intro’ to the album was more than just breaking in the album, it created a whole atmosphere and story. It consists of an uplifting instrumental which intensifies throughout. When I heard it, my imagination went wild. All I could picture in my mind, was this song playing over a brutal medieval battle between two opposing villages. With the music intensifying, this is where the battle gets vicious with gore and dismembered limbs on the ground, with horses running towards one another, men with spears in hands – fighting for their own. Near the end of the track, the music simmers down, reducing down to a simplistic beat – this is where one side of men have conquered and the other defeated. ‘All Will Fall’ is the track which follows. Bursting with filthy riffs and gnarly vocals – what’s not to love? In fact, the vocal style in the chorus strongly reminds me of Norwich band Crawlblind’s sound. The track is full of energy and anger. This would be my top pick for the album, it stands out to the other tracks and is very catchy. One of those tracks you can play over and over at once and not get sick of it. ‘Stench Of Misery’ was another track that caught my attention. Through the construction of the song, it reflects a story-telling feel, through the guitars being more slowed and the vocals being grouped into sections. It reminded me a lot of the style of King 810, but in a death metal form. Something which is a very special addition to the album. Although, the first half of the album seemed very similar, which got a tad repetitive, much of the rhythm and song constructions made it a little difficult to distinguish between the songs, ‘Reflect The Storm’ halfway through the music stops for a few seconds and then progressively fades back in – which didn’t fit very well, especially since when it faded back in, it was in a completely different beat. Overall, the best way I can describe the album is – pure head banging chaos. 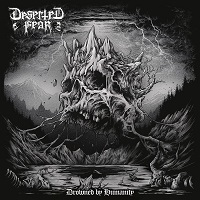 ‘Drowned By Humanity’ is released on Friday (8 February). You can get your copy HERE.